If your question isn't answered below, please use the feedback form! How can I use Reminder Gadget? How do I choose which list shows on Reminder Gadget? 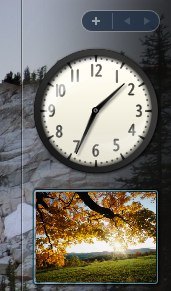 How do I minimize or close Reminder Gadget (stand-alone)? How do I subscribe to a list that someone else has set up? How do I change the settings on Reminder Gadget (e.g. timing)? How do I refresh the information in the gadget? Where is my Windows Vista sidebar? I get a reminder saying I should upgrade. How? I installed a new version and lost all my settings! How do I uninstall the gadget? I've uninstalled, but it keeps wanting to come back! Can I use the gadget on my web page? What about security? How safe is my personal information? How much does Reminder Gadget cost? Why do you charge for this when I can use Facebook for free? Reminder Gadget is an application that allows you to send information directly to the desktops of your friends, family, colleagues and church body. Getting up and running is simple. Just create an account, download the application, and you're ready to communicate. Reminder Gadget has a variety of different applications, but was written specifically with churches in mind. According to Daniel Henderson (or see here), "Only 5% of churches have an effective and organized prayer ministry." Reminder Gadget was created to help provide a solution to this problem. Staying organized and keeping on top of appointments, homework assignments, etc. Either you have never entered your credentials into the settings, or you have entered them incorrectly. The credentials it's talking about are the user name and password for your account with ReminderGadget. 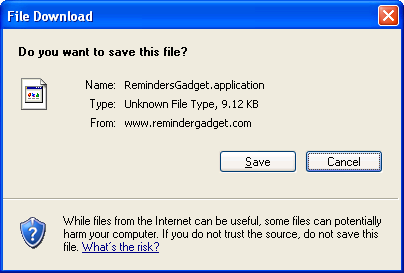 If you have not already created an account at ReminderGadget, do that first. You can do so by visiting here. Assuming you have an account, you will need to enter your information into the ReminderGadget settings. The way you get to the settings page depends on whether you are running the stand-alone version (typically on XP), the Sidebar version (typically Windows Vista or Windows 7), or the Mac version. Stand-alone: right-click the gadget and click "Settings"
Sidebar: hover over the gadget and you should see a little wrench icon appear to the top right of the gadget. Click it. Mac: hover over the gadget and an "i" should appear in the top right corner. Click it. In this dialog box, enter your user name and password, and then click [OK]. To display another list, right click on your Gadget and choose "settings." Select the "lists" tab. On the "list" drop down menu, select the list that you would like displayed. You will now be able to toggle between the lists that you have created by clicking on the arrow displayed at the bottom of your Gadget. By default, the gadget will stay visible on top of other windows. If you would like to hide the gadget, right click on the gadget and select "hide." If you have hidden the gadget and would like to get it back, right click on the icon in the system tray (in the bottom right hand corner of your desktop) and click on "open". If you would like your Gadget to be visible only when nothing else is on top of it, but in the background while you’re working, right click on the icon in the system tray and uncheck "always on top." If you would like to close the Gadget altogether, right click on the icon in the system tray and click on "exit." When creating a list, the owner has the option of making that list either "public" or "private." If you wish to subscribe to a public list, you will need to create an account first. Once you have created an account, login to access your account. Public lists will be displayed in the "available to me" selection in the "lists" drop down menu. Choose the list that you wish to subscribe to and click on "subscribe" to access that list. Some list owners choose to restrict list access. In this case, they would need to confirm individual users as they subscribe. When you click on "subscribe," an email notification will be sent to the owner of that list. The owner can grant access to this list by clicking on the confirmation link included in the email. You will not be able to subscribe individually to a list that is private. With a private list, the list owner specifies which users have access to that list within the Reminder Gadget account settings. Resize Gadget: By default, the gadget will resize itself to fit the item being viewed. However, the user can set the gadget to a fixed size and a scroll bar will be presented for longer items. This may be useful when a specific layout on the sidebar is desired. 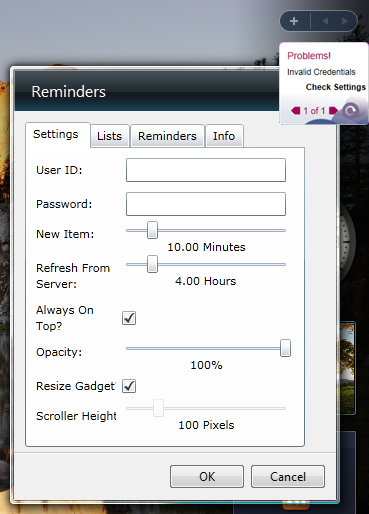 Scroller Height: The user can set the gadget height by selecting "make the gadget a fixed size." 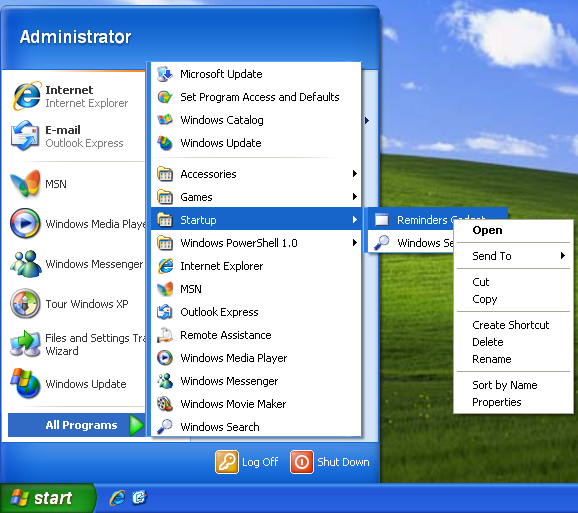 If you’re running Windows Vista, the sidebar may or may not be visible. If it’s not visible, the gadget installation may take a bit longer. The easiest way to have your sidebar appear again is to click on the "start" button and then select "all programs --> accessories --> windows sidebar". That should bring up a window showing available gadgets. Double-clicking on the ReminderGadget should add it back to your Sidebar. It's possible that you're running two copies simultaneously. If you don't uninstall the old version first before installing an upgrade, you can get concurrent copies, potentially with different versions. We're working on finding a solution for this; however, this is primarily an operating system issue. The best way to avoid this issue is to uninstall the old version of Reminder Gadget first before installing anything new. it means that a newer version is available. How you upgrade depends on the version you're using. Unfortunately, the Sidebar does not facilitate easy upgrades. You will need to uninstall the gadget, reinstall, and then re-enter your settings. However, if you are on a dial-up, or have a network that may not be available all the time, it's possible that ReminderGadget starts before the network is available. In this case, you may never get the automatic upgrade notice. To fix this problem, close ReminderGadget by right-clicking on its icon in the task tray and clicking "Exit". Then, make sure your network is connected and re-start ReminderGadget. It should produce the note above. If it does not, you can also simply go back to the installation page and start the installation over. This should upgrade the application without losing any settings. Unfortunately the Windows Sidebar version of the client does not maintain settings over an upgrade. This is a limitation of Windows Sidebar. 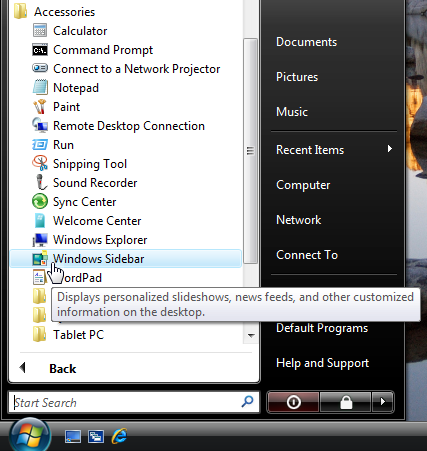 Sidebar (Vista): Hover over the sidebar until it’s visible, click the "+" at the top, find the gadget, right-click, and then click "uninstall"
Sidebar (Windows 7): Right-click the desktop in an open area, click "gadgets", find the gadget, right-click, and then click "uninstall"
Silverlight is a web application framework that integrates multimedia, graphics, animations and interactivity into a single runtime environment. We use Silverlight because it works particularly well for secure communications with the server. It’s also very easy to work with and fits well with the other software required for Reminder Gadget. You will need to install a current version (4.0 or later recommended) of the .NET Framework from Microsoft. The best way to do this is to select it from the optional updates in Windows Update. However, you can also get it directly from here. Reminder Gadget values your privacy. Your personal information will be kept in the strictest of confidence. Our developer says "You have my personal word that I will make absolutely every effort to keep all information secure, and that no information entered into this web site will ever be shared or sold. All data passes over Secure Sockets Layer (SSL), a protocol which provides secure communications on the Internet." There are a variety of different price levels depending on how often you renew your membership. If you sign up for one month, you will be billed $5. If you sign up for 3 months, you will be billed $12. If you sign up for 6 months, you will be billed $18. If you sign up for one year, you will be billed $24. Each membership includes an unlimited number of lists. Every new membership, regardless of initial length, includes a month long free trial. Visit the pricing page for more details. While Facebook is free, Reminder Gadget offers a few distinct and unique benefits that Facebook can't provide. We have high security and no advertising. In addition, you don't have to login to check Reminder Gadget as it's constantly visible on your desktop.